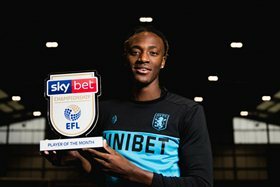 Chelsea loanee Tammy Abraham has won the Championship Player of the Month award for November 2018. The England U21 star is the fourth Nigerian player to win the award since its inception, following in the footsteps of Ade Akinbiyi (Stoke City), Shola Ameobi (Newcastle United) and Sone Aluko who won the award on two occasions, wearing the jerseys of Hull City and Fulham. Abraham scored six goals in four appearances for Aston Villa last month, including netting his first professional hat-trick in the ten-goal thriller with Nottingham Forest. On winning the award, Abraham told EFL's official website : ''I'm delighted to be named Player of the Month. It's been a great few weeks for us as a team as well as me personally. Abraham beat Joe Lolley (Nottingham Forest), Darren Randolph (Middlesbrough) and Teemu Pukki (Norwich City) to the honour of Player of the Month.